The Reck makes its second consecutive Gator Bowl appearance, with the Yellow Jackets facing off against the Miami Hurricanes. This time doesn't go as well as the last, with the Yellow Jackets falling 47-38. The Reck makes another bowl game appearance, leading out the Yellow Jackets before they take on the LSU Tigers at the Georgia Dome. Even though the Jackets played at a venue close to home, Tech falls 28-14. The Reck undergoes a major overhaul with the help of local garages, resulting in a new paintjob and an entire reconstruction of the motor. After news of the terrorist attacks in New York City, Pennsylvania, and Washington DC spread across campus, driver Andy McNeil took special care to return the Reck from a career fair at McCamish Pavilion to its secure home. The Reck travels to San Antonio to hype up Tech fans as the Yellow Jackets play in their second-ever national semifinal versus Oklahoma State. The Yellow Jackets sneak past the Cowboys, but fall to the Connecticut Huskies in the national championship game. The Reck leads the Yellow Jackets out onto the field at Alltel Stadium to face off against the Wake Forest Demon Deacons in their first ACC championship game appearance. The Jackets end up falling to the Deacons 9-6. The Reck is the first car to cross the newly renovated 5th Street bridge connecting campus to Tech Square and Midtown. On the way to a wedding in Savannah, the trailer holding the Reck fails and the Reck tumbles inside. The car pulling the trailer and the trailer itself eventually swerve into a nearby ditch, causing extensive damage to the Reck and the trailer. Driver John Bird and Reck Club work day and night for the rest of the summer repairing the damage to the Reck, ensuring that it works for the first home game of the 2007 season versus Samford. The Reck on "Mad Money"
Jim Cramer and his CNBC show Mad Money visit Tech's College of Management for an episode. 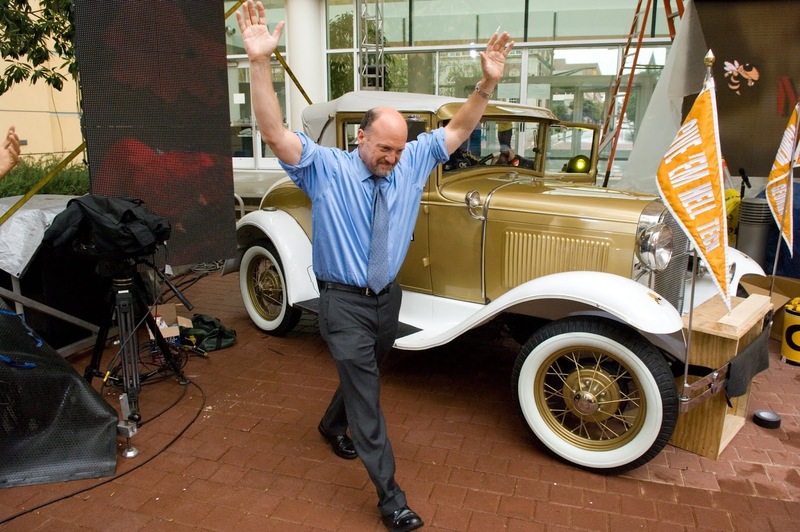 Cramer opens the show by stepping out of the Reck's passenger door, and one of his signature soundboards was strapped to the front bumper. Still recovering from some of the damage in 07, the Reck goes under the knife again, this time to replace the alternator. The Reck makes another appearance in the Georgia Dome for the Peach Bowl, again versus LSU. However, the Tigers stomp the Yellow Jackets 28-3. While riding on the running boards of the Reck as it made a sharp turn, Reck Club member Nicholas Brown feels the railing he is holding onto break, sending him onto the asphalt and slamming his head onto a concrete curb. Brown later sues the Institute and Eco-Clean, Inc (the company that manufactured the railing) for damages for "promoting the unsafe use of a vehicle by students". The Reck travels to Raymond James Stadium in Tampa to lead out the Yellow Jackets before they take on the Clemson Tigers for the ACC championship. The Jackets clinch the title and an appearance in the 2010 Orange Bowl with a 39-34 victory, but a 2011 NCAA investigation into WR Demaryius Thomas's eligibility later strips Tech of the ACC title. The Reck leads the Yellow Jackets out on to the field at Land Shark Stadium in Miami before the Orange Bowl against the Iowa Hawkeyes. Unfortunately, Tech ends up losing 24-14. This trip was funded by a campaign led by Reck Club and boosted by Yellow Jacket fan blog From the Rumble Seat.